Richard began his working life as a craft apprentice and gained practical experience in a multitude of working environments from ship building to bespoke architectural steelwork. 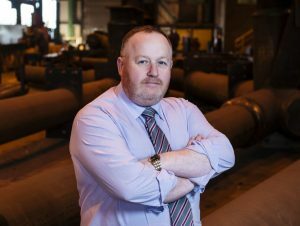 Working with Westbury Tubular Structures first as the senior charge hand then following a succession of major changes within the business became Works Manager and ultimately Production Director taking full responsibility for all production and purchasing activities within the business. Involved in all aspects of the business from estimating through detailing and production. Over the following years held the similar senior position and responsibilities with Barrett Steel Buildings, Watson Steel and Severfield Watson before joining Access Design and Engineering as General Manager where he gained experience in the contracting side of the steel fabrication business dealing directly with clients and engineers ensuring that their expectations were achieved. Richard recently joined SH Structures Ltd as Production Director taking responsibility for production and purchasing activities within the business.